The final day is here! The title race may be over, the top four may be decided, but there is still a small battle for the final Europa League spot mainly between Tottenham and Southampton. Our final relegation spot hasn’t been fully decided yet either, as Hull City are prime contenders, but with a minor miracle they could survive while Newcastle fade away. Meanwhile, the predictions race is going down to the wire, with only a small gap between Bernie, Rishay, and Daniyal. Let’s get on with it! Tottenham v Hull City: Hull all but relegated barring a miracle on the final day. Liverpool v Crystal Palace: Shambolic performance at home from the Reds and well done Palace. Swansea City v Manchester City: Thrilling encounter with goals at either end. Bony scores on his return. Manchester United v Arsenal: Arsenal do just enough to gain a point, United unlucky not to win. West Brom v Chelsea: Pathetic showing from the “Champions”. Lacking motivation. Hilarious Cesc red card. VFL Wolfsburg v Borussia Dortmund: Wolfsburg emerge winners as Dortmund begin their passage of transition. 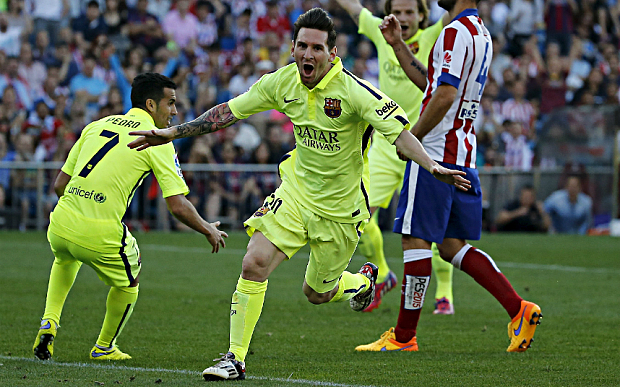 Atletico Madrid v Barcelona: Messi wins the league in typical Messi fashion. One goal to win it all. Inter Milan v Juventus: Juventus dig deep to win 2-1 against their arch-rivals Inter. NE Revolution v Toronto FC: 1-1 draw but Toronto see Altidore injured. Arsenal v West Brom from the Emirates gets us underway. Not much to play for here really as positions have already been decided. Arsenal have automatically qualified for the CL. Chelsea v Sunderland takes place at Stamford Bridge, and Chelsea have already given up on playing football this year while Sunderland have done their due diligence to stay above the relegation zone. Everton v Tottenham will be an intriguing battle from Goodison Park. Tottenham have to win to ensure that they make the Europa League while Everton have only pride to play for in front of their home fans. Could be an exciting game. Hull City v Manchester United is next, and Hull desperately need a win to ensure survival in the Premier League (also depending on a Newcastle loss) while Manchester United have done their part to make it into CL qualification for next season. Could be a dogged affair with a surprise result. Manchester City host Southampton and this game might be one of the most interesting fixtures of the round as Southampton need to gain more points than Tottenham to qualify for Europe next season. Something to play for! Last but not least, Stoke City host Liverpool and this will be Steven Gerrard’s last game in the red of a Liverpool shirt. Continental fixtures bring us Juventus v Napoli. This season’s CL finalists come up against a Napoli side who could have a different manager next season by the looks of it. Lazio v AS Roma is one of the fiercest derbies in all of football. The teams are only separated by one point, and that could mean the difference between automatic qualification for the CL or having to go through a playoff. From our local MLS, Toronto FC host the Portland Timbers in a game they should win, although they’ll have to do it without Jozy Altidore. Let’s predict for the last time this season! Mohaned: Juve vs Napoli: This is the problem with a team winning the league early. Juventus have nothing to play for in the league, and every reason to rest players for the Champions League final. Also, Juve are coming off a 120 minute game midweek where they beat Lazio to win the Cup. Napoli, on the other hand, must get the three points here if they have any hope of making the CL spots. I believe the difference in ambitions and the stakes for both these teams going into the game will make the difference. Napoli should come in hard and with high intensity. 1-2 Napoli. Alexander: Everton v Tottenham: I’m finding this one difficult. Both teams are a little bit on the beach, neither can defend to save their lives, and games between them tend to be what commentators refer to as “ding-dong battles”. Spurs come into this off the back of a 2-0 win over Hull, but let’s be honest, a team of rabbits might have gotten the same result. Hull were atrocious. Equally, Everton’s 2-1 win over West Ham counts for about as much as a German Mark in the early 1920s. West Ham aren’t just on the beach, they’ve bought the whole damn resort. So, who will win this? Everton. Why? Why not? Exactly. 2-1 the Toffees. Bernie: Hull City v Manchester United: This game is worth the prediction because Steve Bruce needs his old team to lie down for him in order for his Hull City Tigers, I mean FC, to remain in the Premier League. After the passionate speech LVG gave at the Man United Player of the Year Awards you wouldn’t expect him to give the opposition an inch. However, with fourth place secure and only the slimmest of chances to steal third, why not give youth a chance? In addition to youth I can see some outcasts playing for United, like Angel Di Maria (wouldn’t have said that when he signed on deadline day). Hull have everything to play for, United have run their race. That said, Hull just don’t seem to have confidence and I think after LVG’s speech United will end on a high. To my sadness, Hull will be relegated. I wish them a swift return. 2-1 Man United. Rishay: Lazio v AS Roma: What a battle this is! The fierce ‘Derby Della Capitale’ gets underway in the Olympic Stadium in Rome. Roma sit in 2nd place on 67 points, while Lazio are in 3rd place on 66 points. As things stand, AS Roma have the automatic qualification into the main draw of next season’s CL. Lazio will have to go through a playoff to get to the main draw. However, if Lazio manage to win, the roles will be switched. There have been some fierce battles lately, not only on the pitch but also in the stands. We could very well be in for a show from these teams as well as their fans. My gut instinct is that Lazio will have the upper hand, as Roma have slacked off towards the latter third of the season and fallen away from champions Juventus. Perhaps their momentum is also lost. We shall see. 2-1 Lazio.